Strictly entre nous: I’m not a fan of Jeanette MacDonald. I am a fan of opera, thank you very much indeed (I begged–and won–for my parents to take me to see Le Nozze di Figaro at the Los Angeles Opera at age 16) but I’d much rather listen to Irene Dunne’s falsetto’s than the fluttery MacDonald’s. (MacDonald’s voice is superior, but Dunne’s has personality.) MacDonald, however, is the leading lady in the 1936 melodrama San Francisco, alongside Clark Gable and Spencer Tracy (big fans of both, for the record), and she delivers a solid performance. But that is not the point of this post. 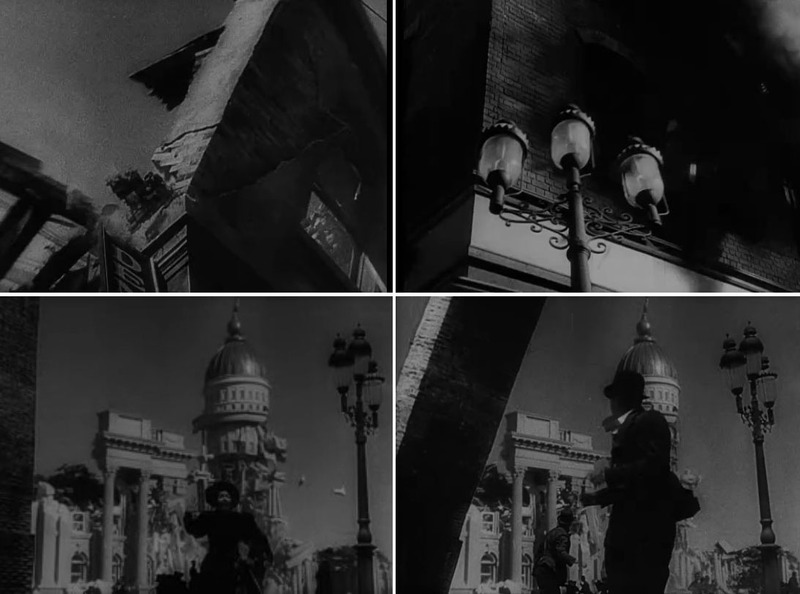 The point here is that San Francisco features a very famous disaster sequence that I have long admired, and have decided take a closer look at it here. The production, being an MGM production, is the high-gloss, spared-no-expense spectacle you would come to expect from the studio, but Woody Van Dyke’s direction keeps things snappy and tones down the melodrama… which is *textbook* melodrama: Chorus girl and aspiring opera singer is torn between her love of her art and her love of her man, set against the disaster of the 1906 San Francisco Earthquake– and then, somewhere towards the third act, this decidedly MGM production becomes as realistic gritty as anything you might have seen over at Warner Bros. Only, the bad guy isn’t a machine-gun slinging Warner Bros gangster- its mother nature. W.S. 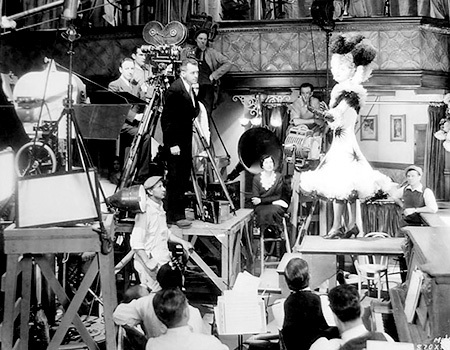 Van Dyke (left) watches as Jeanette MacDonald performs the film’s anthem, San Francisco. Under the supervision of MGM’s head of special effects, and true master of the art, James Basevi, and edited together by montage expert Slavko Vorkapich, seven decades on it holds its own as one of the most powerful special effects sequences ever filmed. Its camera tricks are still rooted in the real world, and therefore tangible. Not the least bit cartoonish, Basevi and Vorkapic recreate one of the greatest disasters in American history by grounding monumental special effects with humanity. Sure, the effects trump the story (even Clark Gable himself hated the soppy lines) and to this day one of the common flaws in disaster flicks is that story is often an annoying necessity keeping us from what we paid our 15 bucks for (or, in 1936, 25 cents. Discuss.) but with effects like these the viewer scarcely feels cheated. I’m not a film academic, but I have watched this particular sequence– rather compulsively– again, and again, and again over the years, and in my opinion it stands out, and stands the test of time, for two specific reasons. 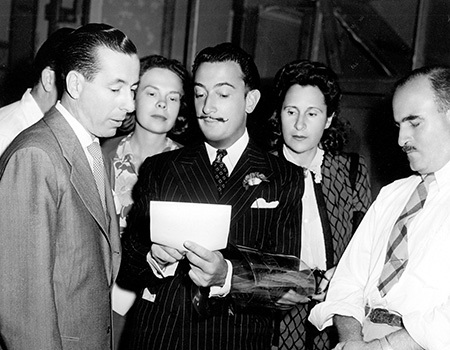 James Basevi (far right) with Salvador Dali (center…duh) during production of Spellbound, on which they collaborated on the famous dream-sequence. San Francisco is a marvelous anomaly. The sequence is book-ended by the protagonists’ dysfunctional affair, but they play no real role in the event. 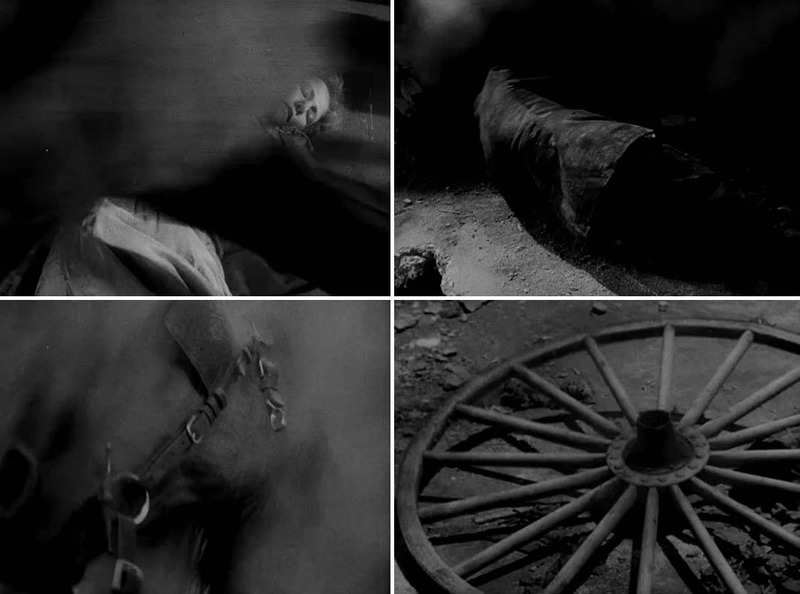 MacDonald queues the sequence, then fades out, and when the sequence is over, Gable brings us back to the narrative. Therefore, freed from any loyalty to the narrative, what we get are two minutes that feel like a prototype of cinema verite. We don’t know any of the faces in the disaster sequence, which makes in particularly real. The people we see are the victims, the unnamed masses of any disaster– natural or manmade– brief glimpses of fellow humankind in their last seconds of life and it succeeds in what disaster films have long since failed in doing: making us aware of our mortality. The second reason Basevi and Vorkapich hit a home run here, is their shared vision: Basevi’s technical wizardy and vision, and Vorkapich’s keen talent of threading together images into powerful collage movement, sound, and light. 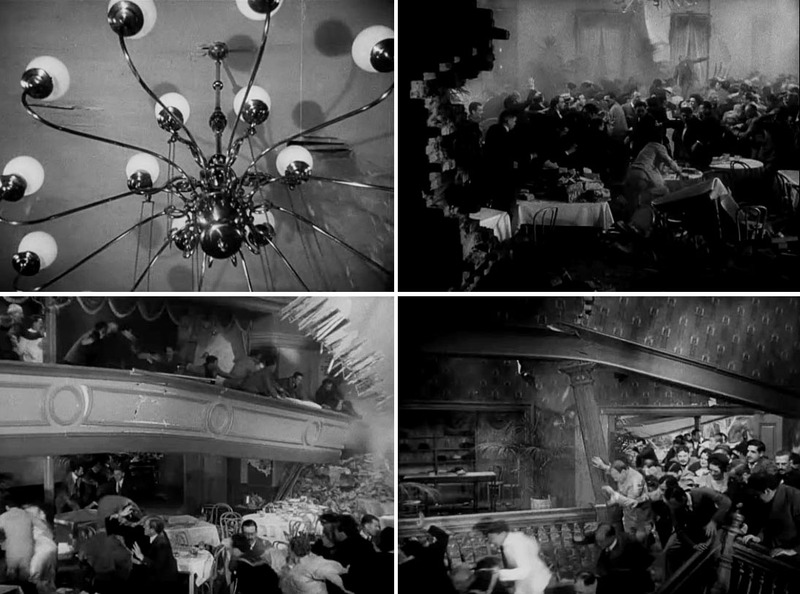 Vorkapich makes full use of Basevi’s monumental effects: the city hall collapsing; the dance hall splitting in two; the streets of San Francisco buying itself in brick and mortar. But he balances it with startling, unexpected close-ups and the human figure. A little girl’s crying face fills the frame, and is cut quickly with the side of a brick building toppling down onto her. 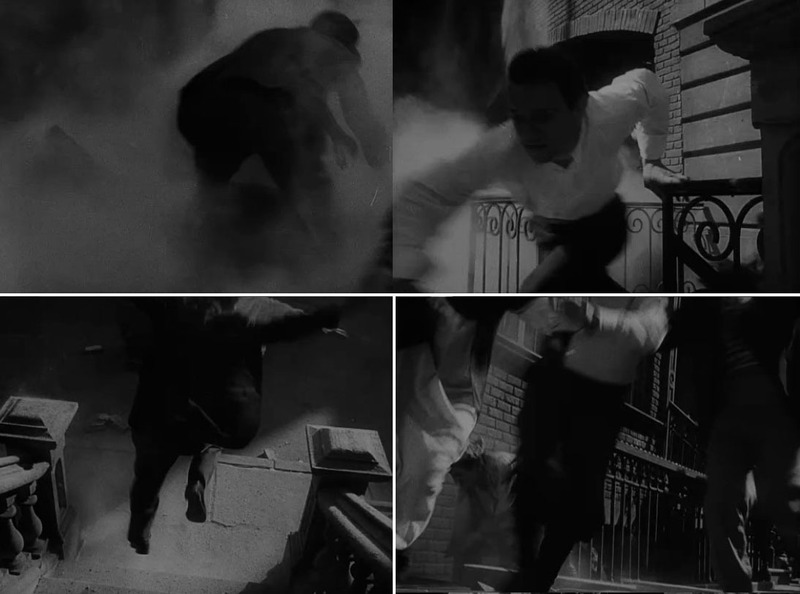 Human movement blurs these frames, and behind them we see debris, mayhem, and dying bodies. It’s a mixed media canvas, and the composting of film trickery and photo-journalistic sensibilities results in something that is disturbing and uncommonly affecting. What Basevi accomplished in 1936 might be archaic in today’s world of 48FPS and mind-bending virtual technology– but the more advanced technology becomes, the further it alienates itself from what Basevi achieved in spades in 1936: true, human reality. The Paradise Club deconstructs onto itself. The city of San Francisco follows suit. Interesting insight, Carley. I honestly never noticed that the actual disaster sequence was completely “divorced” from the protagonists. I wonder what the thought process was when the film was being written and shot. Was it still too close to the actual event to “personalize” it with characters from the story? I don’t know, but 30 years seems like more than enough distance to add fictional characters! The filmmakers must have decided to do it the way they did in order to concentrate on the horrific nature of the event itself. Like you, I was never a fan of Jeanette MacDonald until I saw “The Merry Widow” a few years ago (on TCM) and especially her earlier work at Paramount. Totally changed my attitude toward her. I actually watched most of yesterday’s tribute up until “SF” which I’ve seen many times before. I’m not knowledgeable about opera, but with a face and figure like that, and a sweet vulnerability she displays at her best, I’ve haven’t paid alot of attention to the voice! There are many times when I see a film with one of the great beauties of the period, especially the blondes and redheads like Harlow, Rogers, Blondell, even the adorable Una Merkel, or blue (and grey)-eyed brunettes like Kay Francis, and curse Black and White filmmaking wishing they had been photgraphed in Technicolor. With much of MacDonald’s MGM work (which was nearly all “big-budget,” but which I don’t think is her best otherwise), we at least have one of the stars of that period not frozen for eternity in B&W.